How Can Seniors Help the Environment? Saving the environment has become one of the most important topics of the last decade, and retired seniors are in the perfect position to make a huge impact on both the planet and their own lives. 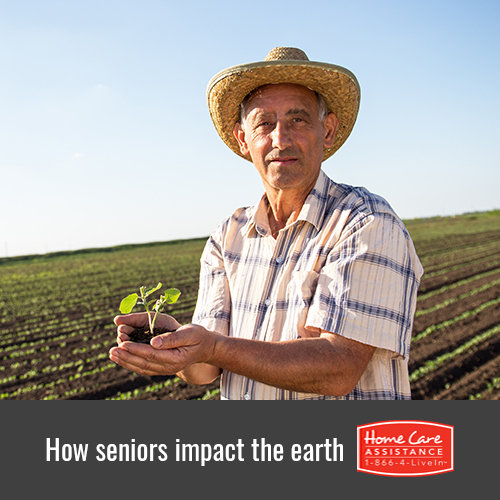 Harrisburg home care experts discuss a few ways your senior loved one can simultaneously become more eco-friendly and boost his or her health. Walking has long been thought of as one of the easiest and best ways for seniors to get daily physical activity. Picking up trash while on a walk not only helps protect our planet, but it can also give your loved one a sense of purpose. Getting rid of litter along a trail or stream is one of the quickest ways your loved one can immediately make a noticeable difference. Much has been researched and published on the devastating effects factory farming has on the planet. Foods grown with large amounts of pesticides wreak havoc on the environment and make us less healthy when we consume them. According to experts, growing food in a garden can make both a person and the planet healthier. Beyond just the healthy produce, gardening provides many other benefits for the elderly, including exercise and cognitive stimulation. Earth Day began in 1970 as a way to promote awareness about the planet and our fragile environment. Observed annually on April 22nd, there are Earth Day celebrations in almost every major city, which can be a great way for your loved one to get out and stay active in the community. Earth Day events can provide your loved one with the chance to interact with younger generations and set a positive example for them, and he or she can reap many personal benefits from volunteering, such as an increased socialization and feelings of self-worth. If your loved one needs assistance with physical activity or transportation to volunteering events, consider hiring a professional caregiver. Home Care Assistance, is a leading provider of Alzheimer’s, Parkinson’s, and stroke home care Harrisburg families trust, and our part-time and live-in caregivers can assist with a wide array of important tasks. For more information on our senior care services, call one of our friendly Care Managers at (717) 540-4663 to schedule a complimentary in-home consultation.